Published: March 21, 2017 • Modified: November 10, 2018 • by Author: Analida • Word count:606 words. • About 4 minutes to read this article. How’re y’all doin’ today? Undoubtedly y’all know about shrimp and grits, right? Then, how about pork and grits then? Grits are so versatile, and since I just got back from South Carolina I have grits on the brain. I am bringing you Latin fusion meets Southern cuisine with Smithfield® Marinated Fresh Pork. 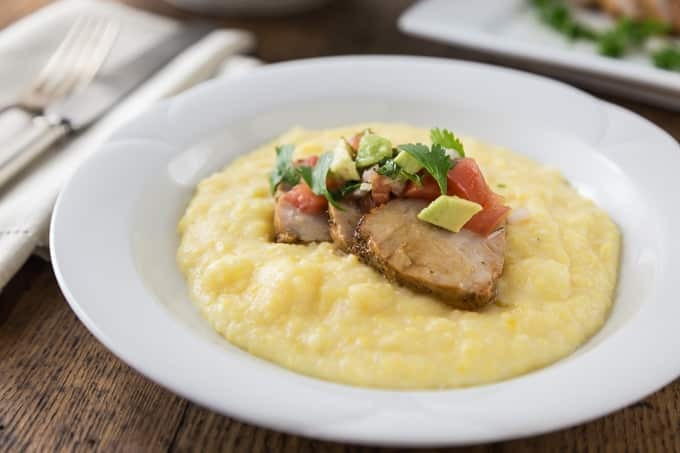 On today’s menu: Roasted Garlic and Herb Pork Loin over cheesy grits with pico de gallo and avocado. 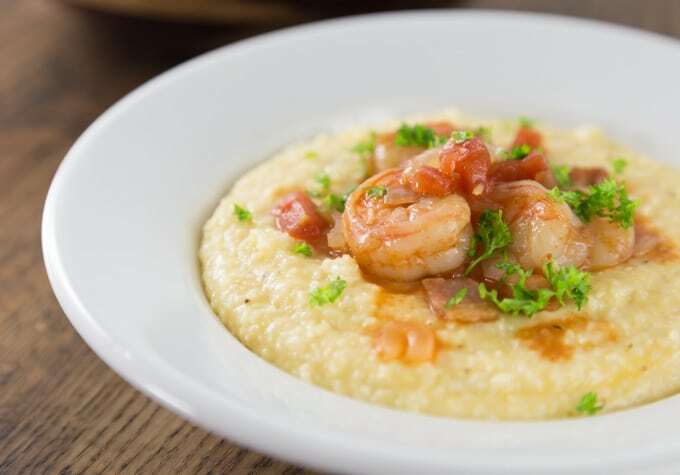 Think about the warm taste of the cheesy grits topped with tangy pico, and tender slices of pork. The flavor profile is amazing! For your convenience and mine, Walmart offers a wide variety of Smithfield® marinated pork products to help you create tasty meals. 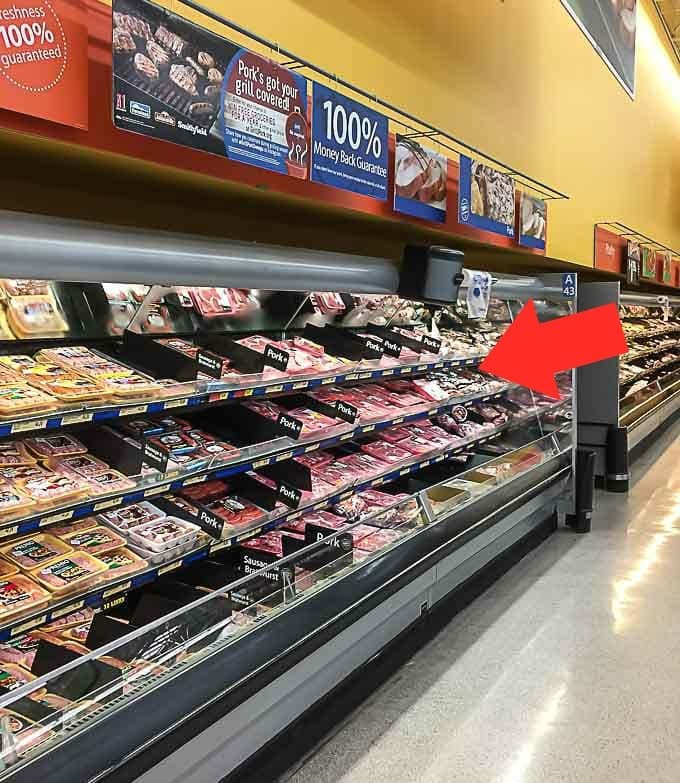 In fact I have a Walmart 5 minutes away, s0 I can quickly head right to the meat aisle where this delectable fresh pork is waiting for me. With the help of Smithfield® you can create a flavorful meal in only 30-40 minutes on any given weeknight. As always, Smithfield® also offers you Real Flavor, Real Fast. By all means, check out Smithfield® site for more recipes . On another note, the word “grits” comes from an Old English word: “grytt” which means a coarsely ground meal. 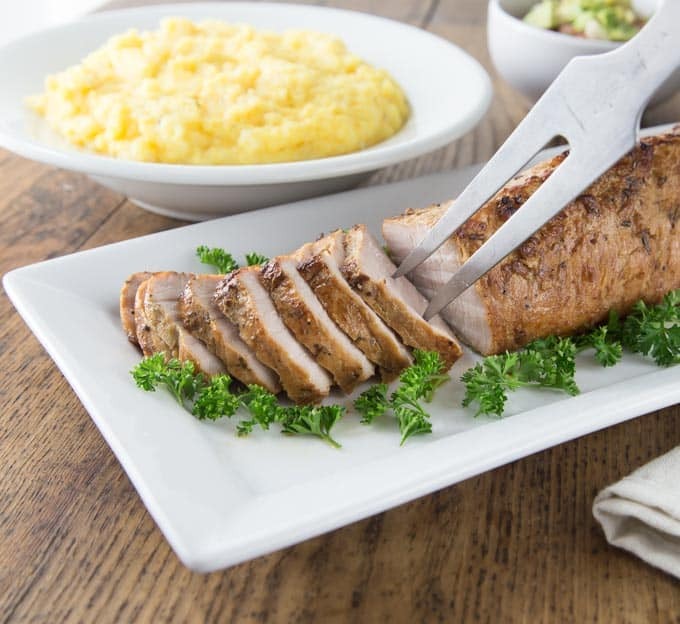 All this history aside, roasted garlic and herb pork loin over cheesy grits can be made in a very short time. How can something so good take so little time to prepare? Well, the ability to multi-task is the key here. You see, while the pork is cooking you can chop up your avocados, AND make the pico de gallo. Next, cook your grits while the pork is resting. 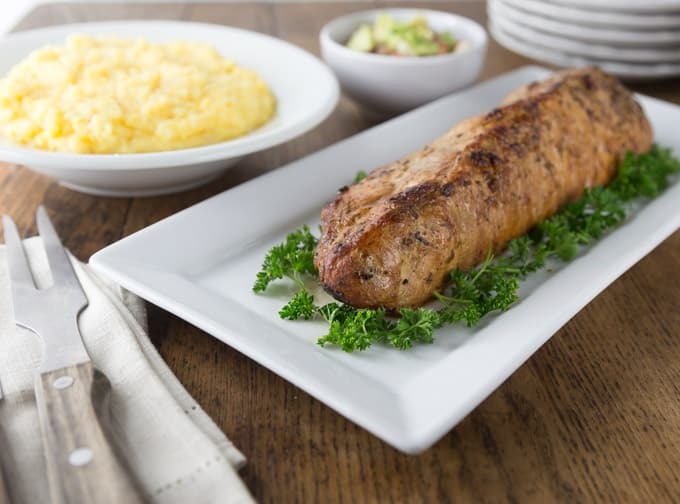 And, just like that you can prepare roasted garlic and herb pork loin over cheesy grits in about 30-40 minutes. 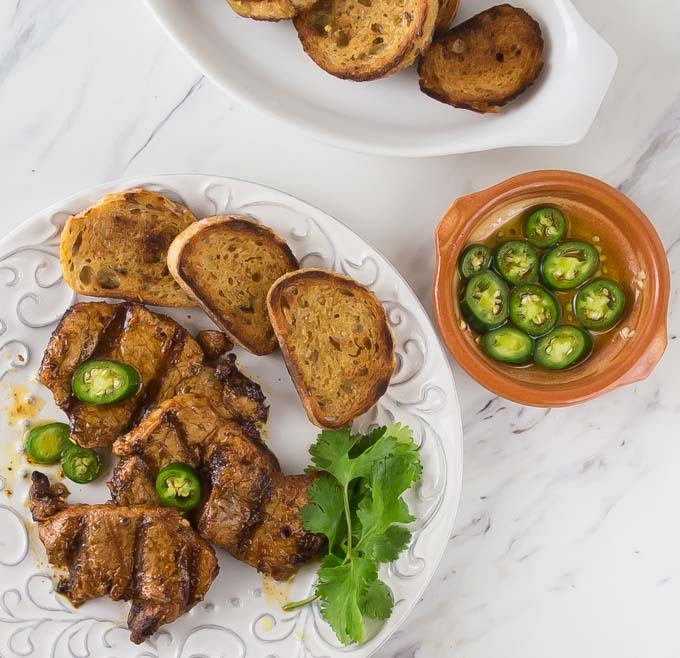 Finally, you can also bet the proverbial farm that anytime you buy Smithfield® Marinated Fresh Pork you get “real flavor, real fast ” I am not kidding, and I am PICKY about my marinades. 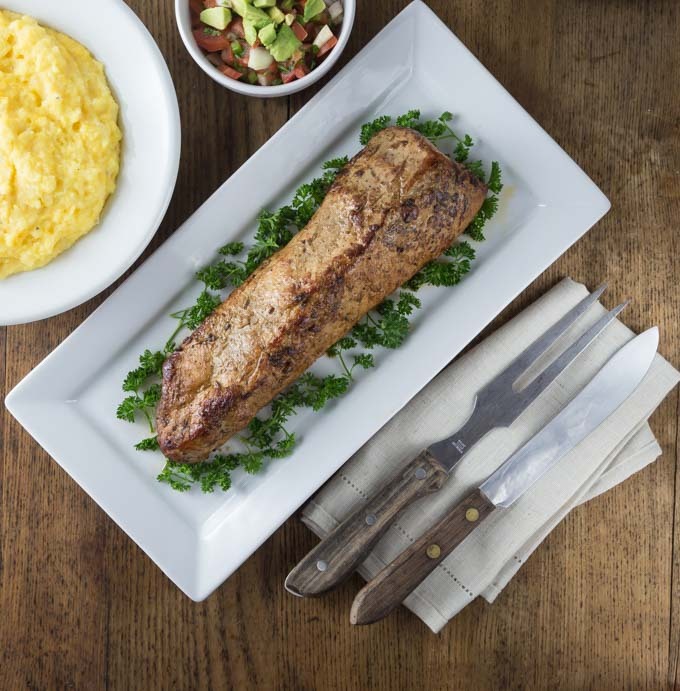 Tender and delicious roasted garlic and herb pork loin with cheesy grits, avocado and pico de gallo. 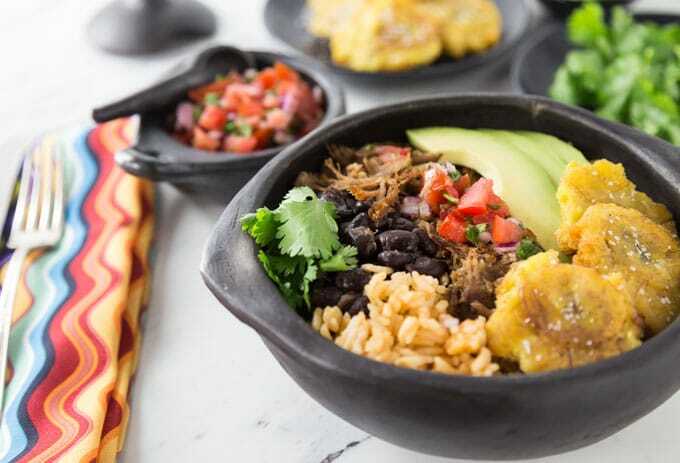 Latin fusion meets Southern cuisine. 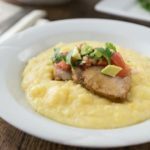 Serve this tasty pork over grits with some spicy pico and you will love the flavors! To make the pico de gallo, place all ingredients in a bowl and mix. Refrigerate until ready to use. To cook the pork, preheat oven to 375'F. In a skillet sear the pork to achieve a golden color on all sides. Place pork in a shallow baking pan and cook following the package instructions. Remove pork from the oven and cover it so it can rest for about 5 minutes. While the pork is resting cook the grits. In a saucepan place water, milk, and salt then bring to a boil. Immediately add the grits and stir constantly for about 5 minutes. Next add the cheese and stir vigorously to incorporate it into the mixture. Finally, serve by placing a mound of grits in a bowl, topped with the sliced pork, a spoonful of pico de gallo and avocados. Quite easy for you since you have a Walmart that is just a drive away from your home. But for me, I think it would be great to get all I need in large quantities. Thanks for the recipe shared. Thanks! Let me know how you like the dish.